I've photographed hundreds of second line parades at weddings, and they never get old! 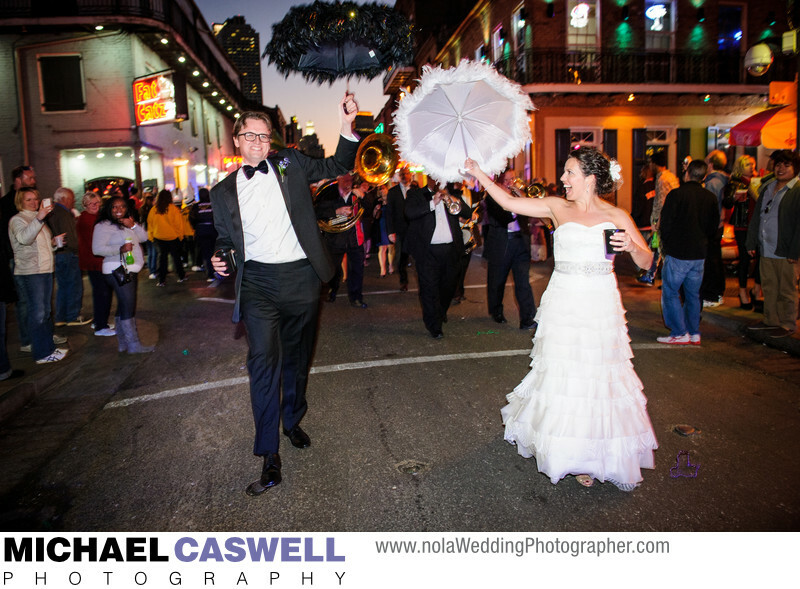 I love the excitement of the bride and groom as the revel in the energy of the cheering crowds along the streets and balconies of the French Quarter, and the guests have a great time as well. Sometimes the parade is scheduled to take place in between the ceremony and reception. If both are taking place in the same venue, this gives the staff time to turn the space around and prepare it for the reception. If the reception is at a different location, a second line is a fantastic way to get everyone there! The parade can also take place at the end of the reception. Of course, in New Orleans, this doesn't necessarily mean the end of the night... usually the second line simply moves the party from the reception venue to one of the Vieux Carré's many well-known bars, where the after-party continues through to the wee hours of the morning. Either way, there are a few logistical items that need to be taken care of. Most importantly, after selecting the time and route for your parade, you need to obtain a permit from the New Orleans Police Department and arrange for the police escorts. You'll likely want bride and groom umbrellas, and personalized hankies for the guests to wave around. And you'll need to pick your musicians, which is certainly something you don't want to skimp on. The Pin-Stripe, Kinfolk, and Algiers Brass Bands are just a few of my favorites. And don't forget to accommodate any elderly family members who might night be able to walk this distance. In the past, transportation in the form of a taxi or mini-bus would be utilized, but in recent years, pedi-cabs have become the ideal for this purpose, allowing these guests to participate in the festivities more than they would if they were inside an enclosed vehicle. While you can certainly accomplish all of this on your own, a good wedding coordinator can make this significantly easier and less stressful.